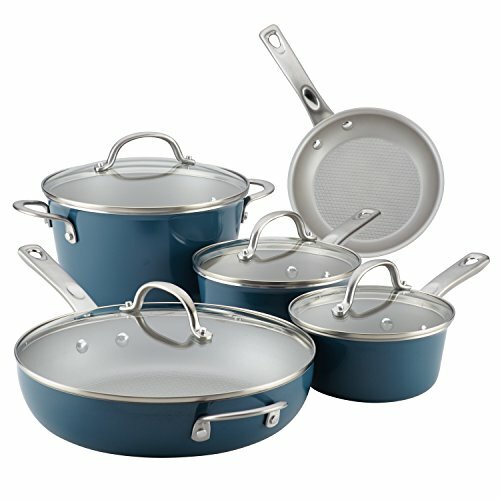 Get inspired and simplify the pursuit of your home chef passions with the Ayesha Curry Home Collection Porcelain Enamel Nonstick 9-Piece Cookware Set.This collection of eye-catching, high-quality cookware includes all the essentials for creating flawless traditional favorites, whipping up fun and easy weeknight family dinners or making a serious signature statement on new recipes for brunches, date night, or holiday get-togethers. Featuring saucepans in two sizes, a covered Dutch oven, and two skillets, gourmets and beginner chefs alike will be prepped and prepared to pull off Ayesha's Brown Sugar Roasted Chicken, Carolina Chowder, or Honey-Pepper Shrimp. Constructed from fast- and even-heating aluminum with stylish hard porcelain exteriors, the cookware features a sleek, flared silhouette in gorgeous contemporary colors. More than just a set of pretty pans, this pro-grade cookware is heat safe to 500 Degree F and features double-riveted stainless steel handles for a sure, comfortable grip and shatter resistant glass lids to lock in heat and moisture for maximum versatility in the kitchen. Interiors boast a diamond-textured surface and enhanced, PFOA-free nonstick coating for long-lasting, effortless food release of even the gooiest recipes like Ayesha's Apple-Cinnamon Oatmeal. Plus, this Ayesha Curry kitchenware helps support No Kid Hungry to provide up to 500,000 meals to children in need. Learn more at nokidhungry.org/onedollar. Set your sights on simple but satisfyingly soulful cooking with the Ayesha Curry Home Collection 9-Piece Cookware Set. If you have any questions about this product by Ayesha Curry, contact us by completing and submitting the form below. If you are looking for a specif part number, please include it with your message.